As I already explained many times, the control of the mind is part of the rider’s training. That said, if you have a tendency to let your mind wander away with some parasitic thoughts, I suggest that you keep your mind busy with a sentence that you will repeat over and over again. Like a mantra, this sentence will help you fight mental disturbances. The goal is to focus your mind on the present moment. I personally like to use the sentence: “My position - My horse – My track”. It’s a “to do check-list” repeated on a loop pattern of the three most important statements to consider when riding. A kind of an on-going status-check that will help the rider to improve each parameter required for successful completion of an exercise. The point is to realise as soon as possible the potential roots of problems. Imagine you enter a show ground, the spectators are here and while you are warming up your horse, you start focusing on a person. Your thoughts will quickly lead you to speculate: “What is this person doing here? Will she/he find me a bad rider? Will she/he find my horse like this or that? …”. Twenty minutes later you are still lost into your suppositions or other thoughts that are useless and will not get ready for your class. Suppose, now, that you enter the warm-up ring with only one goal in mind this time: keeping your mind focused on your position, your horse and your track. Each time, your mind starts to wander away, focus back on your mantra “My position- My horse- My path”. I let you guess the difference these 20 minutes of preparation will make. One should establish a list that fits him best. When you’ll be used to check the key elements of your position, it will take you only 5 to 10 seconds to do so. It is, also, an excellent way to reconnect the sensors of your body, especially when you work on flat or in between fences. Each time I get in the saddle, I make an assessment of my position. It has become a sort of a ritual. The simple fact to think “position” will allow me to instinctively be well seated. For those who know about it, this way of proceeding is the same approach as the NLP (Neuro Linguistic programming). To the extent that your position is correct, your body sensors are able to give you precious information on your horse’s condition. Does my horse have enough energy or not? What needs to be done within the next few seconds or meters? As soon as I think “my horse”, I have the image of the hind legs in my “inner screen”. I visualise mentally where they land. I become aware of the muscle mass that moves them. The most important is to feel what happens behind the saddle. The horse’s motion underneath the seat is what shapes everything else. According to the picture I established, I’ll take different courses of action by asking more or less energy. 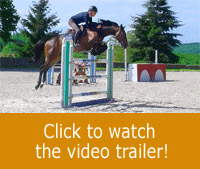 Riders who focus on the mouth only or on outside elements such as the fence for example, forget systematically that the power comes from the hind. 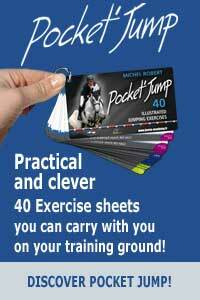 To keep on with the mental assessment of your horse check list, think about the quality of the canter: Is the canter loose or does my horse have the hocks far away behind, with a hollowed back? Are his shoulders drifting to the right or left? Unlike what most riders are doing instinctively, we worry about the neck and head last. “…I’ve got to go in front of this flower pot over the right and this bush on the left….turn in front of the blue oxer…go straight toward the stand…empower my canter to approach the Liverpool…” Being one step ahead mentally will allow you to reset yourself on the predefined track while being aware of the speed. The horse could decide to speed up toward the exit gate of the ring or to slow down going away from it. He can also open his turn more than anticipated to decrease his flexion as well as the engagement of his hind legs. Therefore, it is important to react as soon as possible to get back on the track and the speed wanted. The faster you react, the fewer actions you will need. However, when the horse is on the right path at the correct speed, we can give him some freedom, so he can step into a space of wellness. A space in which the rider doesn’t influence his mount as he has nothing more to ask. To verify if all the parameters are correct, one can do this simple test which consists in releasing some of the connection with the hands and legs. If the horse stays on the anticipated track without modifying it, then the horse and rider are in a good disposition with the correct level of energy. If you get used to do the inventory of these three essential notions, very quickly, you will need to mentally talk to yourself “My position- My horse- My track” to go instantly from a critical position to a favourable position. Ideally, one would need to assess them as fast as possible. It seems evident that if you spend too much time worrying about your position, you will forget quickly about your horse and your track. Same if you think only about your horse without being aware of your position or even where you are supposed to go, difficulties loom ahead. It is the mistake made by a large number of riders who focus mainly on their horse and not also on their track and position. I can promise you that it is rare to have a horse all over the place if the track and the rider’s position are correct. To work every single day on “My position- My horse –My track” will allow you to gain the correct reflexes and not feel overwhelmed in front of a difficulty.